Encephabol benefits | Does Encephabol Increase Brain Power? Derived from Vitamin B6, Encephabol is a water-soluble drug otherwise known as pyrithioxine or pyridoxine disulfide, but perhaps best-known by its generic name Pyritinol. It is a semi-natural drug developed by Merck Laboratories and commercially distributed for use by those with cognitive function issues. In many European countries, it was used to treat children with learning disorders. 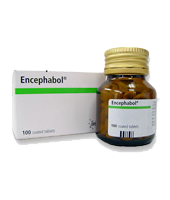 Encephabol is a stimulant that targets the central nervous system and belongs to what are categorized as anti-alzheimer's drugs. Common uses of the medication include treatment for memory impairment and dementia as well as relief from hangover. Encephabol has been available as a prescription as well as an OTC drug in several countries and used to treat various cognitive and learning disorders among children. In European countries, the medication has been approved as a symptomatic treatment of chronically impaired brain function in dementia syndromes and in supportive treatment of sequelae of craniocerebral trauma. Many people find the use of Encephabol to be very beneficial especially in terms of treating hangover. However, the actual main purpose of the medication is to help increase mental function, due to the nootropic compounds present within that may bring such results. Encephabol users are likely to experience sleep disturbances as a result of increased excitement. There are also cases where the user would experience loss of appetite, headache as well as tiredness. Rashes on the skin and an irritation in the mucus membranes may occur as well. Other side effects of Encephabol may include itching, nausea and vomiting. In very rare cases, it has been found to cause acute pancreatitis and photoallergic eruption. As a precaution, pregnant women and lactating mothers should use this with care. This nootropic is generally safe for use on the elderly and children. How does Encephabol help brain function? It is unclear as to the exact mechanism of action of Encephabol. It is believed, however, that the medication increases the ability to deliver glucose into the brain. The brain is incapable of using fat as a source of energy, unlike the other parts of the body, and instead uses glucose, which it is incapable of storing. It is believed that this increase from Encephabol in glucose uptake, in theory, would result to an increase in energy and thus an increase in the brain function. Want more information on which supplements ranked better than Encephabol? Then take a look at our brain supplement reviews!